Take me home, Come on, Hurry! Can you hear the angel's sing? Oh, Can't you see? Oh, Can't you tell? Pretty please, Come on, Hurry! Here's to me, So much fun!! And everyone, VERY MERRY CHRISTMAS!! 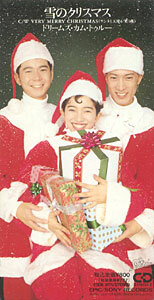 Yuki no Christmas’s main claim to fame is that it is the original Japanese version of the DCT #1 single, Winter Song. Both songs are of equal, excellent quality. Winter Song just came along when DCT was at its height, so it’s the one that got the accodales. This single also features the first known DCT English language song, Very Merry Christmas. Special Note: This is only one of two places that you can find the song Yuki no Christmas. The other place is the more easily findable re-release of Winter Song. It was never released on an album.